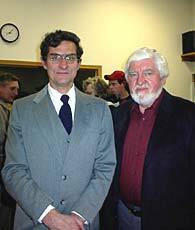 [JAN. 13, 2003] Lincoln Daily News is sorry to report the death of Logan County Board member Lloyd Hellman. Our deepest sympathy goes out to his family, dear friends and colleagues. Hellman had been under medical care for health problems. 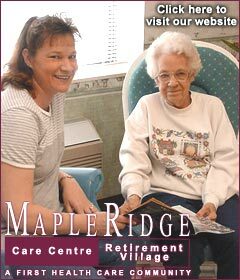 He was a highly valued member of our community. LDN will have a tribute to him tomorrow. 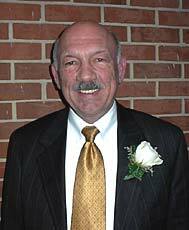 [JAN. 13, 2003] Ron Schilling, executive vice president of Lincoln College, has been selected by the board of trustees as the institution’s 18th president. President Jack Nutt had previously announced plans to retire in May but moved up the date because of continuing health problems. Nutt has led Lincoln College since 1982. During his 20-year administration the college has built a campus in Normal and has substantially added to the Lincoln campus. Schilling counted nine construction projects in Normal, including additions, and 10 in Lincoln during Nutt’s presidency. "Dr. Nutt has been an outstanding leader and brought this campus to where it is today … a financially secure institution with enrollment at full capacity," LC board chairman Elvin Schmidt stated. Schilling came to the college in mid-1984 as dean of business services. He was named provost in July 1996 and executive vice president in December 1999. Schmidt said Schilling’s "ongoing enthusiasm for the campus and the students makes him a clear choice" for the presidency. "Ron Schilling brings to the position a combination of academic stature, practical experience at several levels of administration and a clear understanding of Lincoln College’s aspirations," Schmidt explained. Schilling holds a bachelor’s degree in business education from Western Illinois University; a master’s and a certificate of advanced study, both in school business management, from Northern Illinois University; and a certificate in banking and finance from Blackhawk College. From 1969 to 1983 he served as assistant dean of business services at Sauk Valley College. Prior to that he taught business at Prophetstown High School for six years. The new president said, "I am thrilled to be the board’s choice to lead the campus to the next step." His vision for the future of Lincoln College includes more construction, a larger endowment, steady enrollment and small class size. Plans to construct an athletic and convocation center, called the Lincoln Center, and a new LC museum were announced during Nutt’s presidency. Schilling said he hopes to break ground for the Lincoln Center by late spring or early summer at the latest. Construction on the museum may come somewhat later, although Schilling would like to start both projects at the same time if funding is in place. Down the road he also hopes to add to the administration-classroom building in Normal and to enlarge the Midwest School of Cosmetology, an LC subsidiary located on the Normal campus. One of Schilling’s goals is to increase the college endowment during the next five to 10 years. To that end he has created a president’s cabinet to handle day-to-day administration, enabling him to be gone more and to spend substantially more time on fund-raising. In addition, the college is seeking a vice president of advancement. The post has been vacant since Bruce Clausen’s departure in May 2002. Schilling also aims to maintain student enrollment within three already-defined market niches: (1) students recruited for sports and fine arts programs; (2) local commuters; (3) students who were excluded from prestigious institutions as freshmen but want to prepare to transfer later to the college of their choice. Lincoln College claims an 89 percent transfer rate for graduates with an associate’s degree. Schilling said competition for students is increasingly difficult because other schools are now building what LC did five years ago. Schilling’s fourth goal is to reduce the student-faculty ratio, which slipped from 13-to-1 to 15-to-1 in 2002 as enrollment increased. He hopes to add one or two faculty members this fall and others in future years if funding allows. By increasing the number of faculty he expects to maintain or reduce average class size, which has crept above 16 this year. The new president praised his predecessor’s leadership in establishing a baccalaureate program in Normal: "Dr. Nutt has done an excellent job helping to build the college into a first-rate institution. In fact, his most recent accomplishment is the addition of the ‘2+2 Program,’ which offers students a baccalaureate degree at our Normal campus." After completing the associate’s degree, students can apply for the second two-year program, leading to a bachelor of arts in liberal arts or a bachelor of science in business management. The 2+2 program, which is beginning its fourth semester, enrolled 155 students in fall 2002. Schilling was named acting chief executive officer on Sept. 15, 2002. In that role he has formed an admissions committee to review all applications for enrollment. He said the committee formalizes a previously informal procedure and tightens the admissions process. Schilling’s wife, Joyce, is business and office manager for Century Dental Center in Lincoln. They have three children: Kristin Klockenga, a second-grade teacher at Washington-Monroe School in Lincoln; Stacy Schilling, a customer service representative for DuPont of St. Louis; and Tony Schilling, director of admissions at Lincoln College. Schilling is active in First United Methodist Church, Elks Club, Lincoln Rotary Club and Lincoln /Logan County Chamber of Commerce, for which he is a red-coat ambassador. 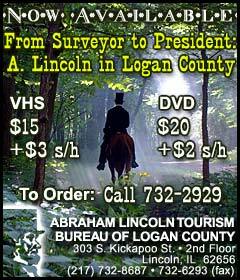 [JAN. 13, 2003] Two seatings were required for Saturday night’s premiere showing of a video depicting Abraham Lincoln’s involvement in Logan County because the crowd of over 400 exceeded the 300-seat capacity of the theater. The video, produced by the Looking for Lincoln committee of Main Street Lincoln, is titled "From Surveyor to President: A. Lincoln in Logan County." It presents significant events in which Abraham Lincoln is known to have participated in the county. Ron Keller, Lincoln College Museum director and curator, called the filming of this local material "a long overdue project." Many of those present Saturday night at LC’s Johnston Center for the Performing Arts were watching their own performance, or a family member’s, or even their horse’s. Kathy Taylor of Taylorville said of the video, "I thought it was great and very informative." Her daughter’s pony Snapple was in the film. Alex Barnett, 8, of Springfield said she enjoyed the part where she, as Nina Gillett, is giving a look to her father John D. Gillett, portrayed by Lee Johnson. "I also liked seeing Grandma [Gillette Ransom of Elkhart] because I thought she was a good player as Mary Todd Lincoln," Barnett added. Illinois State Historian Tom Schwartz said cities sometimes overlook their greatest tourism asset -- their own local stories. "Artifacts pale in comparison to stories," he continued. "Ultimately it is the stories that visitors respond to." Schwartz, a historical consultant to Looking for Lincoln, said the project aims to help visitors experience the Lincoln who "walked among people, not above them." Speakers on the program included Schwartz, Keller, Beaver, Main Street Lincoln manager Cynthia McLaughlin and Ron Schilling in his first official act as president of Lincoln College. Dean Williams of Springfield filmed the video in late September. Narrated by Chuck McCue of Mount Pulaski, it shows scenes in or near Atlanta, Cornland, Elkhart, Lincoln, Middletown and Mount Pulaski. A grant from Illinois FIRST supported the project. Schilling praised the inclusion of events from throughout Logan County. Many were shot in authentic locations, such as Mount Pulaski Courthouse, Stagecoach Inn at Middletown and the Hoblit carriage house -- now a shed -- near Atlanta. Footage of Lincoln riding along Edward’s Trace near Elkhart takes the viewer back to the 8th Judicial Circuit of the 1800s. Other scenes are set in rural areas uncluttered by modern intrusions. A surveying party crossing a stream and the christening of the city of Lincoln were shot on the Conrady-Paulus farm near Lincoln. Greg Conrady of rural Hartsburg plays a doctor in the christening scene. "It was fun," he said, "but it’s not something I’d like to do a lot." Repeating the scene "again and again and again" grew tiresome. Conrady was able to wear his own clothes for the scene, except for his hat, which was his son Cody’s. Gillette Ransom was in charge of costumes. Marilyn Craig of Lincoln said she found the video so touching she was almost moved to tears. Part of the mystique was watching people she knew, and the historical authenticity seemed to transport her into the time period. Joe Woodard of Villa Grove played the unbearded, pre-presidential Lincoln. After seeing the completed video for the first time Saturday night, he said he enjoyed the process of making it and was interested in how the scenes were put together. "It’s something we’ve been wanting to do for years and years," Lincoln Mayor Beth Davis said of the project. "I’m glad we have so many dedicated people in the county to put this together." A reception continued through the two showings of the video, with music provided by the Possum Holler Pickers. At the premiere, Paul Beaver, Lincoln College emeritus professor of history and chair of the local Looking for Lincoln committee, announced a $5,000 gift from Bill Lane of Portola Valley, Calif, to go toward duplicating the video and disseminating it to schools, libraries, tour companies and others. Lane is making the gift in memory of his parents-in-law, the late Art and Louella Gimbel of Lincoln, and in honor of their children, Mary Lou Gimbel (Mrs. Homer) Harris of Lincoln, Donna Jean Gimbel (Mrs. Bill) Lane of Portola Valley and Art Dale Gimbel of San Mateo, Calif. Bill Lane, former owner of Sunset Publishing Company, was ambassador to Australia during the Reagan administration. Copies of "From Surveyor to President: A. Lincoln in Logan County" can be obtained at the Main Street Lincoln office on the second floor of Union Planters Bank or by phoning 732-2929. The VHS version is $15 plus $3 postage and handling, and the DVD is $20 plus $2 postage and handling. [JAN. 13, 2003] Gov. Rod Blagojevich's inauguration ceremony began at 11 this morning. Events surrounding the inauguration, including a train tour and a barbecue, began Saturday morning and continue through tonight. Festivities will end with two inaugural balls at the state fairgrounds. For a complete listing of this weekend’s events and information on Illinois’ new governor, visit the state inauguration site.